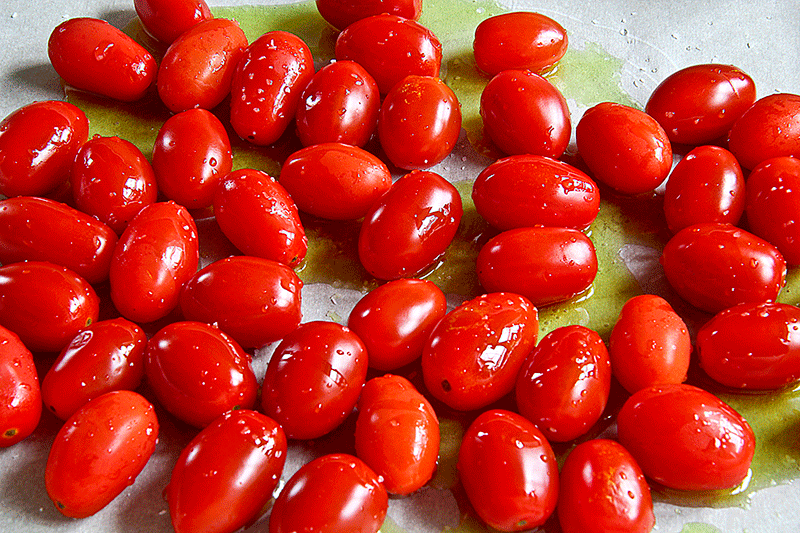 Preheat the oven to 285 ° F. Wash and dry the cherry tomatoes, then place them on a baking tray lined with oven paper. Season the cherry tomatoes with 5 tablespoons of olive oil and a pinch of salt then toss them to distribute the seasoning. After that, bake the cherry tomatoes for 1 hour and 45 minutes. Finally, let them rest in the oven off for another half hour or so. Meanwhile, the tomatoes bakes in the oven put the jars in a pot along with the caps wrapped in clean cloths. Fill the pot with water, making sure to cover the jars with water at least 3 inches above their height. Put the pot on the heat and count 30 minutes from when the water starts to boil. Then remove the pot from the heat and let the water cool down. Now take the jars and caps out of the pot and let them dry upside down on a clean cloth until they are perfectly dry. Prepare a mixture with 1/2 pint of vinegar and 1/2 pint of water, then bring to boil in a small pot. It is possible to change the amount of solution depending on your pot, but it is critical to mantain the 1:1 ratio, and boil the ingredients in at least 1.5 inches of liquid. Now, boil the herbs and garlic 3 minutes, then raise and let them dry perfectly over a clean cloth. Another option is to opt for dried herbs and garlic: in this case, it is not necessary to boil them into the solution before using. 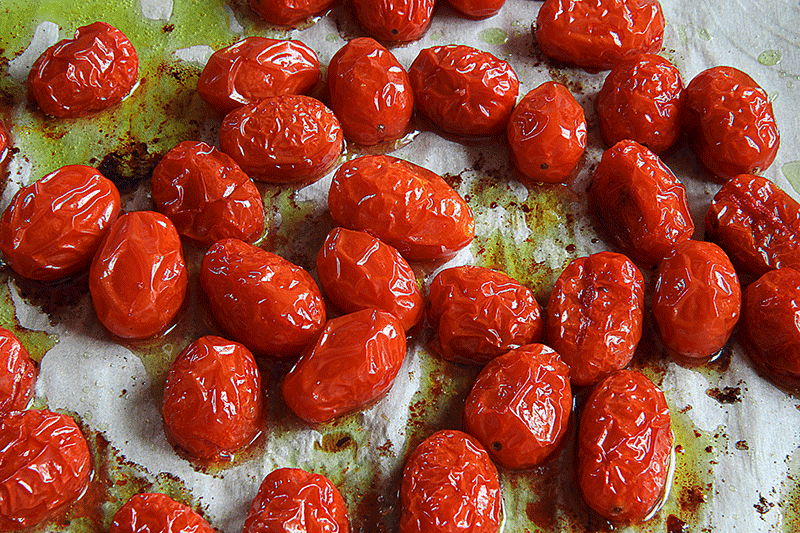 When the roasted cherry tomatoes are cooked, let them reach room temperature. Now, gently store them in the jars as soon as possible, alternating scents and herbs. I prepared some with oregano and others with parsley, pickled capers, and crushed garlic. Leave the last finger of the jars empty then fill the remaining space with olive oil. Just be sure to submerge tomatoes completely. 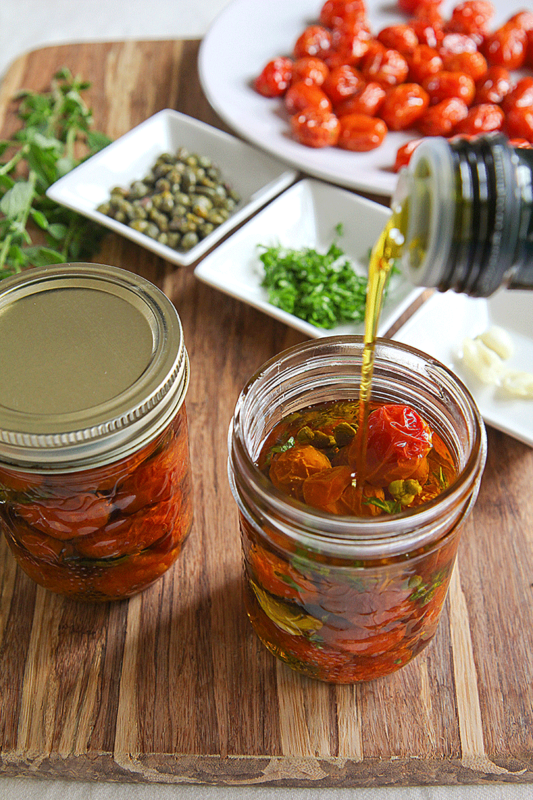 The day after, open the jars and check if cherry tomatoes are still completely immersed, otherwise add more oil. Cherry tomatoes prepared in this way may be used immediately, but the Italian tradition wants the tomatoes stored in a dark, fresh and dry place, at least 1 month. 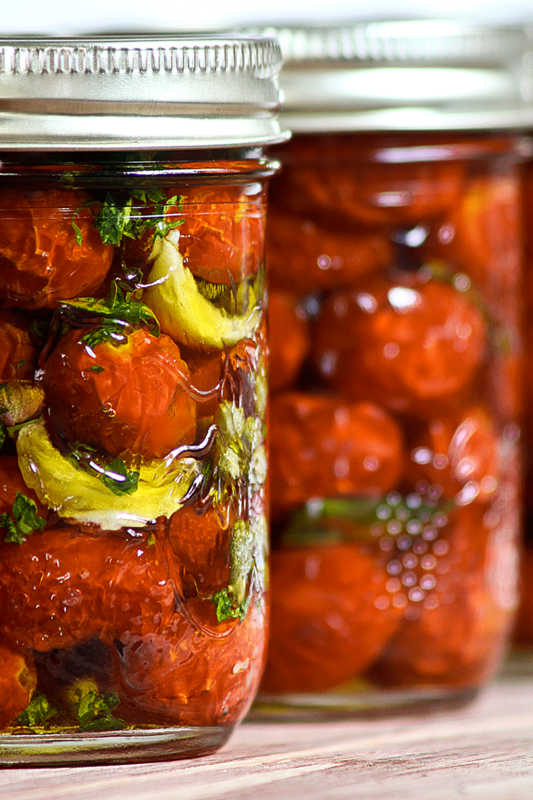 If you are not comfortable with long preserving, just store the jars into the fridge up to 15 days. Before sampling the tomatoes, open the jar and check that there are no mold or weird discoloration. After sampling store the remaining tomatoes and consume in a few days. Prepare a mixture with ½ pint of vinegar and ½ pint of water, then bring to boil in a small pot. It is possible to change the amount of solution depending on your pot, but it is critical to mantain the 1:1 ratio, and boil the ingredients in at least 1.5 inches of liquid. Now, boil the herbs and garlic 3 minutes, then raise and let them dry perfectly over a clean cloth. This sounds Amazing but You said tomatoes will last up to a year, but is it necessary to seal the jars in a hot water bath? In the tradition sealing jars with the preservation in oil is not necessary. Just be sure the tomatoes are completely submerged into the oil all the time of storing. The oil will protect the tomatoes. Check the tomatoes before eating and do not hesitate to discard them if they are over the line of the oil. The water bath could change the oil flavor, but if you feel more safe, do it. Do you put the tomatoes in the jars while they are still hot, or do you wait until they have cooled? This a very good question! Best if the tomatoes reach room temperature before store them in oil. I will add this advice in the recipe description. So you store them unrefridgerated in a dark cool place. What temperature do you consider cool? What is the purpose of the vinegar and water? Can you not use fresh herbs/garlic? I am growing tomatoes and a few herbs so this is a good way to use the tomatoes. Also can these be stored in the fridge or freezer? Thanks sounds like a good way to preserve my harvest. Hi Brenda, thanks for your question! Traditionally, In Italy garlic and herbs used to be added fresh, and some people still preserve them in this way. But recently, to avoid any problem with botulinum, it’s considered safer to boil the garlic in a solution of water and vinegar in order to adjust its pH. Same thing regarding fresh herbs: they must be boiled and dried with extreme care; otherwise dried herbs are recommended. Tomatoes do not require any treatment because their pH is already acidic enough. 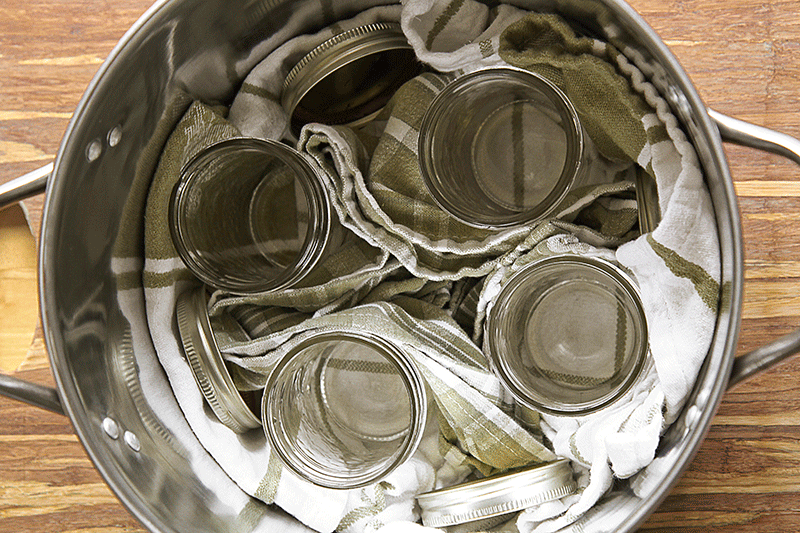 Remember: you want your jars and lids perfectly sterilized and dried before filling them with tomatoes. I have never tried to store my jars in the freezer. I’m afraid the tomatoes would loose in flavor. What type of vinegar did you use? cant wait to try..have bumper crop of cherry tomatoes this year. I’m very happy to hear this, Elizabeth! I can’t wait to try this! 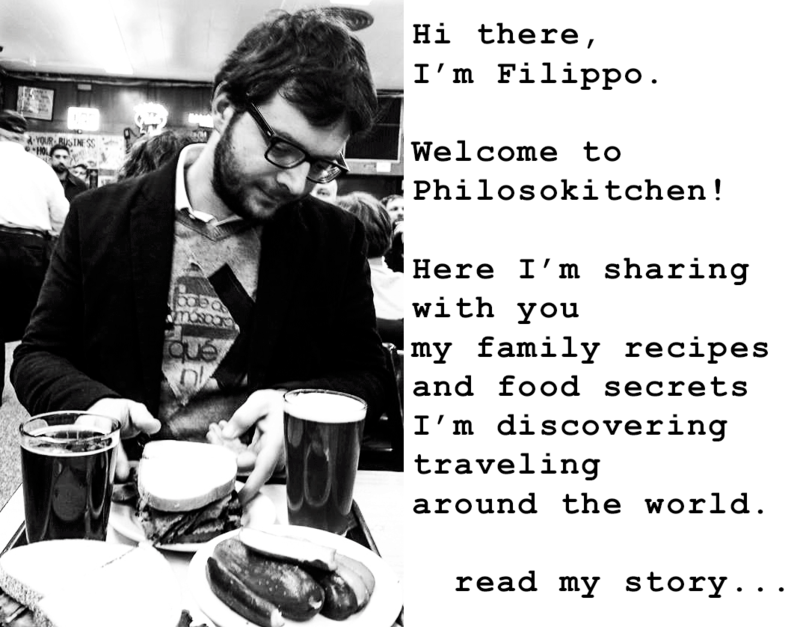 I’m hoping my Italian husband will wait a month to try them! Ok, I’m confused! What do you do with the vineager and water you boil the herbs in? Don’t they lose flavor into that solution? Do you used the vineager and water or discard it? Just discard the solution after use. You want to boil the hebs and garlic into the vinnegar solution to let them reach the right PH safe for canning. 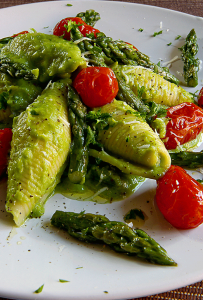 recipe sounds good, great use of cherry tomatoes that produce in abundance. Hi, 2 pints of solution to boil a small amount of herbs/garlic. Seems somewhat a waste. Couldn’t a smaller amount be used with the same 1:1 proportion? You are right the tomatoes develop a really nice flavor. I have this on my to do list. Why do you need 2 pints of water and vinegar for just 3 cloves of garlic and a few herbs? Seems a lot. This morning I’ve been doing some experimenting to reduce the amount of the solution. It is possible to use half of a pint of vinegar, and half of a pint of water using a smaller pot, but it’s critical boil the herbs and garlic in at least 1.5 inches of liquid. Why is it important to dry the herbs after boiling? To avoid foodborne risks; otherwise, use dried herbs and garlic. This recipe looks good and easy to prepare. I made these last August. Used one jar on the top of home made focaccia bread and added Carmelized onions. It was awesome!!! Will make more this year. Thanks for the reciepe. Will make in quarts next time. Hi, I make something similar every year, I roast mine with garlic and basil and put them into the freezer but I will try this way this year.